This report allows you to keep an eye on all types of restore actions performed across the selected Veeam Backup & Replication servers. The report analyzes all guest file, application-level and full VM restore activities performed by any authorized user and arranges this information by the type of performed restore action. Restore details show the initiating user, name of the recovered item or VM, the intended restore destination and the success status of the completed job. Since files can be restored from the Veeam Backup & Replication console, Veeam Backup Enterprise Manager and Veeam Self Service File Restore portals, using PowerShell scripts or through REST API, in large environments with multiple backup administrators it is often hard to track all performed restore actions. The report helps you track the initiator of each restore attempt, find out the most popular recovery items and establish historical trends. 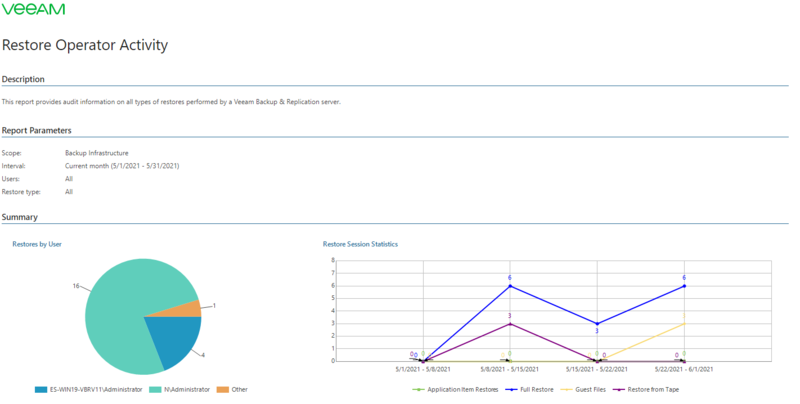 Users: defines backup administrators and restore operators whose restore activity must be analyzed. Restore Type: defines a restore type that should be evaluated (Full VM Restore*, Guest Files Restore, Application Item Restores, Restore from Tape, All). *This entry includes the following components: full VM restores, Instant VM Recovery, restore of virtual disks, VM files, Replica Failover.